More widely known for its gumboots, agricultural and industrial rubber products, Skellerup NZ recently completed a project at Gulf Rubber - a subsidiary that specializes in more esoteric and high-performance plastics. The product, which has been 3 years in development, is a precision moulded dual material plastic bush used in automotive drive train components. The RoHS (Restriction of Hazardous Substances) Directive introduced in 2006 created new challenges as heavy metals such as lead and cadmium were required to be removed from all kinds of automotive sub-assemblies. From circuit boards to drive trains and suspension RoHS has had an impact - and created new opportunities. An example is the humble "centering bush". An outer shell provides a supporting structure to an inner cylinder which in turn allows a shaft or rod to rotate or translate. The tolerances are very fine as any slop between the rod and the bush effects performance of the overall product. Conventional bushes were made from brass or bronze, which often contained lead to improve machineability. The new synthetic bush developed by Gulf Rubber comprises a lubricated plastic inner moulded bush in a hard plastic outer casing. Gulf Rubber is one of only two companies worldwide who have perfected the manufacture of this particular component. The product will find its way to Vietnam to be included in a rubber overmould before being used in drive shaft assemblies on vehicles. Initial volumes are over 200,000 units per year. The manufacturing quality demands are stringent with Outer Diameter/Inner Diameter (OD/ID) and Concentricity tolerances in the order of +/- 0.05mm. When Gulf Rubber embarked on this project they new from the outset that they wanted nothing short of 100% inspection. Philosophically, and from a liability/cost of re-call standpoint, there was no other way of ensuring the required quality standards where met. 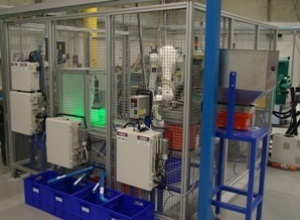 The fully automated robotic workcell used to manufacture the bushes was developed in house in collaboration with ABB New Zealand, suppliers of the robot, and ControlVision, who supplied the vision inspection solution. A small 6-axis robot picks up four bush inners at a time from a bowl feeder and loads them into a moulding machine which adds the moulded outer case. The finished moulded components are transferred to an indexing vision inspection station where they undergo high precision gauging. The vision system comprises a 5 Megapixel Basler Pilot camera with high quality telecentric optics and composite front/back LED lighting. ControlVision VisionServer framework and HMI software with the Cognex VisionPro imaging processing tool library performs the gauging and records all inspection measurements. Finished parts that pass the inspection are dropped into plastic lined cartons ready for shipment; all without the need for human handling. All OD/ID measurement results are captured in an MS-SQL database for SPC analysis and reporting. 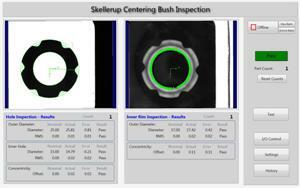 Shaun Spacey, Product development manager at Skellerup, comments on the confidence online vision inspection brings: “It's a great feeling at start-up as the system rejects every part until the mould is up to temperature and tolerances are correct”.